A lot has changed for the Chilhowie football program over the past four years, but one thing has remained consistent. When the Warriors were 2-8 in 2015, who toted the rock? Three years later, Sanchez is still the face of the Warriors back field. Three years later, the Warriors are 13-0. So far, the Warriors are right on schedule. Personally, for Sanchez, perhaps his biggest challenge in the playoffs thus far was in round two when Gabe Fiser and the Grundy Golden Wave came to Smyth County. With the numbers Fiser had put up in Grundy during the season, many would probably tell you he was the best tailback in Class 1 among the southwest Virginia schools. Sanchez wanted to prove otherwise. Behind Sanchez’s 201 rushing yards and three total touchdowns, Chilhowie moved past Grundy with ease in a 63-14 second round route of the Golden Wave. 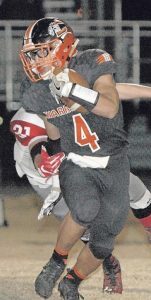 The performance from Sanchez was enough to be named the CoalfieldSports.com Offensive Player of the Week for round two. The matchup with Fiser added an extra chip to the shoulder of the 5-foot-9, 195-pound tailback. If outsiders haven’t given credit to the Warriors running attack yet, they soon should before it smacks them in the face. 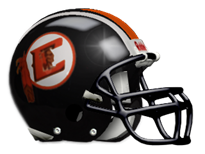 Sanchez has established the career rushing record for Chilhowie. It is a record that currently stands at 5,408 yards. The bruising tailback in the orange and black has rumbled for 1,784 just this season. Not only has the offensive line led the way for the tenacious runner, but he credits his coaches for much of his success. However, as Sanchez would be quick to tell you, it all starts at the top. The type of success that Chilhowie has had to this point is unfamiliar. The Warriors are 13-0 for the first time in school history. For Sanchez, it is just a sign of what they have always wanted. Unlike many kids in various small towns, Sanchez was not wrapped up in the Warrior teams of his youth. 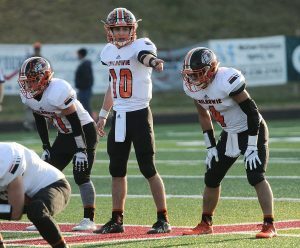 However, now that he has become the face of Warrior football for years to come, the importance of Chilhowie football has done a 180 in his life. As for the rest of the playoffs, Sanchez’s focus will not waiver. The bruising back realizes he must take the same approach to each game, just like he has the past four seasons. “Our mindset for the playoffs is to not take any team lightly and play our best game,” he said.